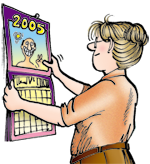 August | 2014 | FBorFW Strip Fix For Better or For Worse Comic Strip by Lynn Johnston. Lynn's Comments: This sentiment reflects the feeling I had when my women friends moved away from Lynn Lake. In this small town, good friends kept me sane. When my friend Nancy Lawn left for Edmonton, I told her I was happy for her, and I really was! I congratulated her husband on his promotion and transfer, and I earnestly wished them well. As they drove away, I waved and smiled until their car disappeared, and then I cried. I cried for all the good times we could have had. I cried for me. This entry was posted in Uncategorized on August 1, 2014 by stripfix. This entry was posted in Uncategorized on August 2, 2014 by stripfix. Lynn's Comments: I did this Sunday page after I was squeezed in half by a sadistically designed lawn chair. I brought the chair into my studio and drew the exact position it was in when it maimed me. I felt relieved and vindicated even before the art was published. This job came with unlimited and curative benefits. I was jubilant when I took the chair to the dump. This entry was posted in Uncategorized on August 3, 2014 by stripfix. Lynn's Comments: Guilt is a wonderful thing--It makes us honest, it makes us humble. It makes us apologize. In my opinion, in this world, there just isn't enough of it! This entry was posted in Uncategorized on August 4, 2014 by stripfix. This entry was posted in Uncategorized on August 5, 2014 by stripfix. This entry was posted in Uncategorized on August 6, 2014 by stripfix. Lynn's Comments: The name "Brittany" was chosen because my friends, Don and Beth, named their first daughter "Brittany." Their second daughter, they named "Elly!" This entry was posted in Uncategorized on August 7, 2014 by stripfix. Lynn's Comments: My first husband used to come home from work, look around the house and say, "What did you DO all day?" The house was tidy, the laundry done, dinner was prepared and the baby was clean, fed and sleeping. I felt I had put in a full day's work--plus overtime! This entry was posted in Uncategorized on August 8, 2014 by stripfix. Lynn's Comments: In my next life, I'm coming back as a man. This entry was posted in Uncategorized on August 9, 2014 by stripfix. This entry was posted in Uncategorized on August 10, 2014 by stripfix. This entry was posted in Uncategorized on August 11, 2014 by stripfix. This entry was posted in Uncategorized on August 12, 2014 by stripfix. This entry was posted in Uncategorized on August 13, 2014 by stripfix. This entry was posted in Uncategorized on August 14, 2014 by stripfix. This entry was posted in Uncategorized on August 15, 2014 by stripfix. Lynn's Comments: I chose Thunder Bay as the city where Connie and Lawrence were moving because it was too far away for a friendly visit. Even though it's in the same province, it's a long drive to Thunder Bay from Toronto. I knew that, despite promises to do so, these two ladies would not be seeing each other for a very long time. This entry was posted in Uncategorized on August 16, 2014 by stripfix. Lynn's Comments: My kids liked most vegetables, so eating wasn't a problem. 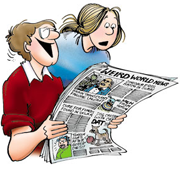 A cartoonist who draws on family stuff for gags, however, needs the gag reflex of unpalatable foods--and the thing about peas is, they're funny! Squash is funny because of the name, and of course the goofy shapes it can come in. A head of lettuce can be funny, I guess, but peas are made for comedy. They are hard to get on a fork, look like frog parts, and roll onto the floor easily. They are easy to spit, mash, or fling off a spoon. They can be bright or bilious green depending on how "left over" they are, and dogs, for the most part, hate them. Anything a dog won't eat is usually spurned by kids. I have done several gags about this maligned dicotyledon, and the surprising result is that I have had no complaints. I thought there was a reader out there for every complaint possible, but so far I have heard nothing from pea fanciers, associations, or "protect the pea" movements, and I'm curious; now that I have mentioned this lack of interest, will I finally hear from these people? This entry was posted in Uncategorized on August 17, 2014 by stripfix. Lynn's Comments: My mother was a wonderful seamstress. She could make anything, which was a blessing because we couldn't afford to buy much in the way of clothing. One year, she found several good quality raincoats at the Salvation Army store. She washed and ironed them, took them apart, and remade them into coats for my brother and me. They were attractive, stylish and beautifully finished. Nobody could tell they had been made from second hand fabric. Even though it looked good on me, I refused to wear mine--not because it was second hand, but because it wasn't what the other kids were wearing. My mom was near tears but said nothing as I put on my blue cardigan. I never did wear that coat. This is one of the many nasty little things I did that I still regret. Guilt. Sometimes, it can last forever! This entry was posted in Uncategorized on August 18, 2014 by stripfix. Lynn's Comments: My granddaughter is, at the time of this writing, two and a half years old. She is active and curious and constantly on the go. Her mom, dad and I read to her, play with her, and try to answer all her questions. She is a joy, but still, we look forward to the day she'll be able to go to kindergarten. Not because she is too much to handle; she is just so ready to learn! This entry was posted in Uncategorized on August 19, 2014 by stripfix. Lynn's Comments: It was never my intention to have Connie and Lawrence move away. It just happened! Once Connie's relationship with Ted soured and Uncle Phil met Georgia, Connie's personal life was on hold. An opportunity for her to take a good job in another town seemed like a positive step, so the story took this turn. What the move did was give me another challenge to deal with and a new family to welcome. This helped to keep the story interesting. This entry was posted in Uncategorized on August 20, 2014 by stripfix. This entry was posted in Uncategorized on August 21, 2014 by stripfix. Lynn's Comments: When we moved to the North Bay area, people confused it with Thunder Bay. I was hoping that readers would go to a map and see where Thunder Bay is--and they did! The next time you see a beautiful piece of amethyst, such as crystals in a large geode, it might have come from this area. Aside from its nice hotels and good restaurants (something to look forward to when you travel the trans Canada highway) Thunder Bay is famous for its amethyst. This entry was posted in Uncategorized on August 22, 2014 by stripfix. Lynn's Comments: I wanted to explore the sense of loss we all share when a good friend moves away. I think this must be harder for children to deal with. In our case, we were the ones who left and Aaron's friends were sad to see him go. It wasn't until we had settled in our new house and the excitement of moving was over, that he began to feel the loss as well. This entry was posted in Uncategorized on August 23, 2014 by stripfix. This entry was posted in Uncategorized on August 24, 2014 by stripfix. This entry was posted in Uncategorized on August 25, 2014 by stripfix. Lynn's Comments: Katie was starting grade two when we moved to North Bay. (The children in the strip were three years younger than Katie and Aaron). The little school she attended was about a mile and a half down the road, next to a hobby farm. At lunchtime she and the other children could watch the animals through the fence; a donkey, chickens, and some rabbits. On occasion, the farmer would take the kids for rides on his donkey, which I thought was charming. I said to her, "Katie isn't this a great place to have a school?! This is something you'll remember for the rest of your life!" and she replied, "Yeah, I will --'cause it stinks!" This entry was posted in Uncategorized on August 26, 2014 by stripfix. Lynn's Comments: Miss Lyon was indeed the name of Katie's Kindergarten teacher--she enjoyed being in the strip! This entry was posted in Uncategorized on August 27, 2014 by stripfix. Lynn's Comments: Aaron's grade two teacher in Lynn Lake told me that little kids felt good about seeing their classmates coats on the hooks outside their rooms because it meant that their friends were there. If a coat was missing, they noticed right away and were worried. Sheena had some wonderful observations about the kids in her charge and I said to her, "If you ever write a book, I'll illustrate it." Sheena Baker wrote, "There's A Worm in my Apple," which I did illustrate. It's out of print now, but it was a sweet and funny read. It was released in 1985 by Stoddart Publishing and the ISBN number is: 0-7737-5029-0. Maybe you can find it online somewhere. I still laugh when I read it! This entry was posted in Uncategorized on August 28, 2014 by stripfix. Lynn's Comments: In Lynn Lake, we would walk the kids to school. When we moved to rural Ontario, even though Kate's school was close by, the bus would pick her up and drop her off at our mailbox everyday. Aaron, too, caught the school bus, and because he went to a different school, he had to transfer to another bus in town. For both of them, it was a whole new experience, in a very different place. This entry was posted in Uncategorized on August 29, 2014 by stripfix. Lynn's Comments: There were times when well meaning friends, knowing I was at home, would drop in during the day. I would come up from the studio, long enough to be polite--sometimes I'd put on the coffee, but I was on a deadline and every minute spent away from the drafting table was time I'd have to make up later on. One woman was very unhappy when I told her I had to work. Having two kids of her own, she looked at me angrily and snapped "So do I!" When I look back at all the comics I did while juggling family, food, chores, business trips, volunteer stuff and just plain living, I wonder how I managed to do it all. This entry was posted in Uncategorized on August 30, 2014 by stripfix. Lynn's Comments: Listening to Katie talking to her dollies, I realized I was hearing myself. Her choice of words, her phrases, inflections, and body language, had all been learned from me. I'm sure I was parroting my mother when I directed my children, and now that I'm a grandmother, I'm waiting to hear if my granddaughter will talk the way HER mother does! This entry was posted in Uncategorized on August 31, 2014 by stripfix.